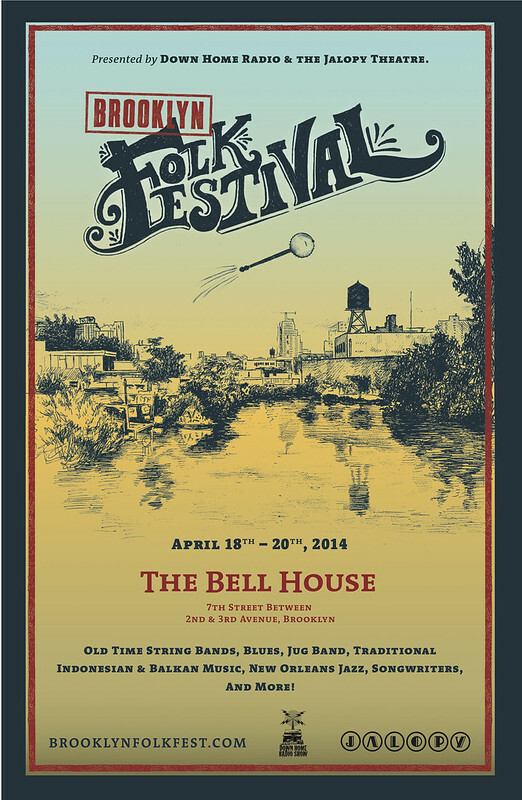 7th Annual Brooklyn Folk Festival: April 17th-19th, 2015! 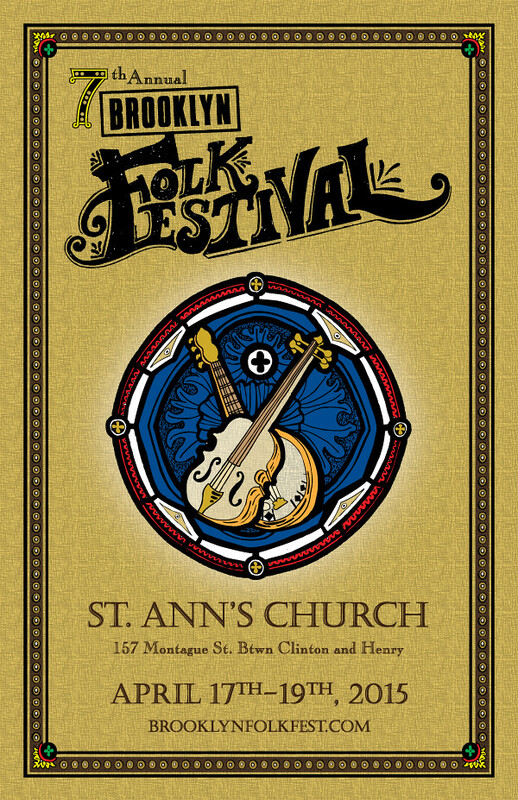 Hey folks – The 7th Annual Brooklyn Folk Festival is on it’s way! Get your tickets now! Complete 30 band lineup below! PLUS! Workshops, film screenings, and the BANJO TOSS competition! The Brooklyn Folk Festival, a co-production of Down Home Radio and the Jalopy Theatre, is almost here! It’s gonna be an incredible event! – with 30 bands, film screenings, workshops, jam sessions and contests! Coming up April 18th – 20th, 2014 at the Bell House, a great venue here in Brooklyn. The Brooklyn Folk Festival is now going into its 6th successful year. This year’s festival will focus on Old Time String Band music from the United States and will feature a number of traditional groups and musicians coming to the city from various parts of the South, representing their local traditions, as well as a number of great groups from right here in New York. We will also have Indonesian Gamelan gong music, Andean music from regions of the old Inca empire, Balkan music, jug bands, blues, jazz, songwriters and more… a huge wealth of talent! The festival will feature Frank Fairfield and Jerron “Blindboy” Paxton, Dom Flemons and Hubby Jenkins of the Carolina Chocolate Drops, R. Crumb with the East River Stringband, as well as 25 other bands and performers. The Brooklyn Folk Festival is modeled on the early days of the Newport and University of Chicago folk festivals and seeks to present an authentic folk festival experience, with a diversity of traditional music, as well as contemporary songwriters, plus workshops, jam sessions, film screenings and the famous Banjo Toss contest! There will also be a very nice tribute to Pete Seeger with group singing and a family friendly square dance. Its gonna be fun! Get your tickets right away!.. visit the festival website at: www.BrooklynFolkFest.com for the compete schedule and ticket information. Come check out the festival – It’s free and open to the public, out in Washington Square Park in New York’s own Greenwhich Village! * The stage is located just East of the central plaza/fountain area of the park. Seating will be provided. Here’s what happened last year at the inaugural 2011 festival! 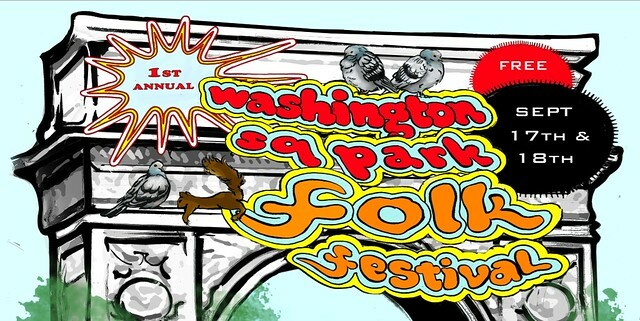 Hello everybody, just letting you know about the upcoming Washington Square Park Folk Festival. I got hired by the Parks Department to produce the first ever folk festival in Washington Square Park. Gonna be fun! The festival is FREE and open to the public! Its gonna be an excellent two days of music, with 9 of my very favorite groups (including my own) gracing the stage and myself on hand to serve as your MC. Hope to see you there! 2011 also marks the 50th anniversary of the 1961 “Washington Square Folk Music Riot” when the City tried to revoke the permit for folk musicians to play and sing on Sundays in the park. They needed to clear undesirable people out so that they could satisfy local real estate interests and I heard possibly enact a crazy plan to extend 5th ave. through the park! Luckily folkies resisted the attempt by the police to kick them out of their public space, resulting in the “riot,” and the planned extension of 5th ave never materialized. There’s been a film made about the “riot” and the film will be screened at the festival. Coverage of the so called riot has been offered by The Indypendent and NPR. Brooklyn Folk Festival Fund Drive! We’re doing a fund drive to help produce this year’s Brooklyn Folk Festival. Please check out the awesome silent movie (above) produced by the Jalopy Theatre for this special event! We really need your support to help make this years festival happen. Donations can be made through our page on Kickstarter: CLICK HERE. Four years ago, Eli Smith of Down Home Radio Show and Jalopy Theatre and School of Music teamed up to present the Brooklyn Folk Festival. A three-day event showcasing folk music of all styles, the festival highlights local Brooklyn musicians as well as bringing in folk music from around the world. By the second year, there were lines down the block with sold out performances every night and it was time to expand. The festival was moved from Jalopy Theatre to the Brooklyn Waterfront Artist’s Coalition in Red Hook for the third year. An unexpected loss of venue this year sent us searching for a new home. 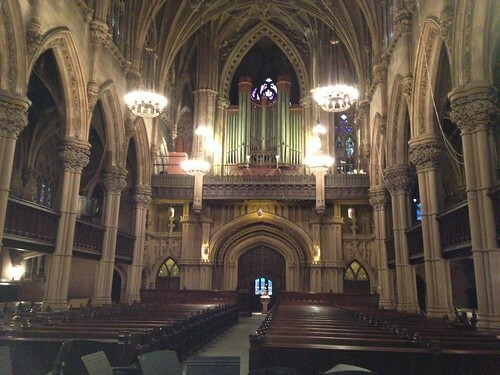 The 4th Annual Brooklyn Folk Festival will be held at 345 Jay Street in Downtown Brooklyn. Your donation will help us transform this raw space into a venue worthy of the Jalopy name! The festival is set to be better than ever with over 30+ bands, vocal and instrument workshops, film screenings, a square dance, a special program celebrating Woody Guthrie’s 100th birthday year – as well as the return of the much loved “Banjo Toss” of 2011. Jalopy and Down Home Radio Show are committed to respectfully compensating our artists while keeping the festival tickets at an accessible price range for the public. We are also inviting 100 local students to attend the festival free of charge as an educational outreach to the community. Thus, we are raising funds to help cover artist fees, advertising, space transformation, and staff. We believe in the power of folk music to forge community. We’ve seen it happen here at Jalopy and want to expand our reach to as many people as want to listen. Your donation will greatly help us get the word out about the festival and keep folk music alive and thriving in Brooklyn for many years to come. See you at the Folk Fest! Brooklyn Folk Festival postcard, pre-stamped to send to a friend! 1-Day ticket to the festival + poster OR a Jalopy Theatre T-shirt! 2-Day ticket to the festival + poster OR a Jalopy Theatre Sweatshirt! 3-Day ticket to the festival + poster! 1 VIP Weekend Pass to the festival PLUS entrance to one show a month at Jalopy for a year! 2 VIP Weekend Passes (The $150 reward) PLUS free entrance for both of you to one show a month at Jalopy for a year! 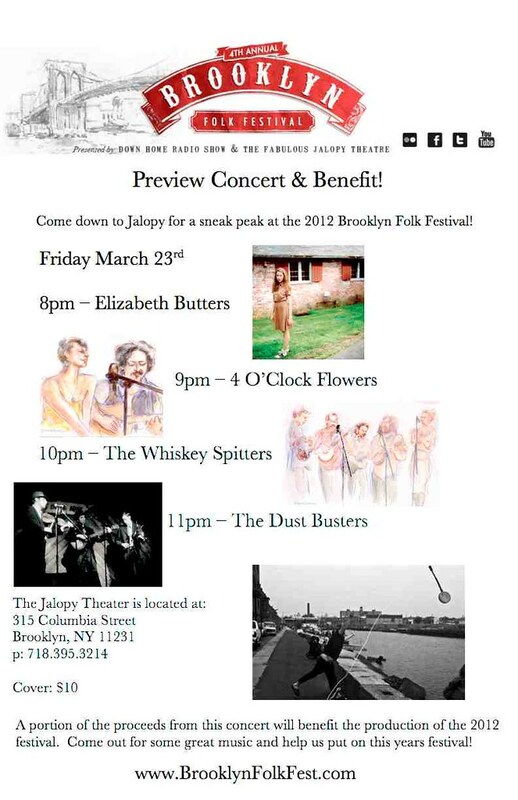 Brooklyn Folk Festival 2012: Preview Concert and Benefit! Today we mourn the loss of David “Honeyboy” Edwards, one of the greatest blues musicians there ever was. Honeyboy was an incredible talent in his guitar playing, singing, songwriting and also with his rack harmonica playing (see his 1979 Folkways album, “Mississippi Delta Bluesman” as well as his very first recordings made by Alan Lomax in Clarkesdale, MS, 1942, among many others.) Honeyboy was not only an amazing artist but also through his longevity became the last living link to the world of the old Deep South that created the Folk-Blues. That world was a small world, and many of the people that created the blues knew one another. Honeyboy counted as friends and musical associates Big Joe Williams, Tommy Johnson, Robert Johnson, Charley Patton, The Memphis Jugband and others and undoubtedly ranked among them as one of blues music’s great practitioners. With his passing the kind of deep feeling and subtle mode of expression that he lived and breathed in his music leaves the world a diminished place. On today’s show we revisit my extended interview with Honeyboy which we recorded when he came to play at BB King’s club in New York in 2006. I picked up Honeyboy and his manager and harmonica player Michael Frank at La Guardia Airport and drove them back to Michael’s brothers house on the Upper West Side. Once there we relaxed in the living room and Honeyboy and I recorded this interview. He was easygoing and easy to talk with and very generous with his time to speak with me, just a kid. I knew Honeyboy and Michael from when I had booked them a couple of years before to play at the Oberlin College Folk Festival and felt lucky to be able to reconnect with them in New York. In this interview Honeyboy reveals many fascinating insights, vignettes and critical information gathered during his 80+ years as a professional musician. He talks about his days playing in Memphis with the Memphis Jug Band (plus how to blow a jug and build a tub bass) and Big Walter Horton, living and playing in the Mississippi Delta and then Chicago with all the greats there, how to hop a 1930’s freight train and get away with it as well as lots more. I used the interview as a chance also to play a number of my favorite recordings by Honeyboy, as well as recordings by many of his musical associates he mentions, to give listeners not already familiar with his work and milieu a better understanding of his life and music. 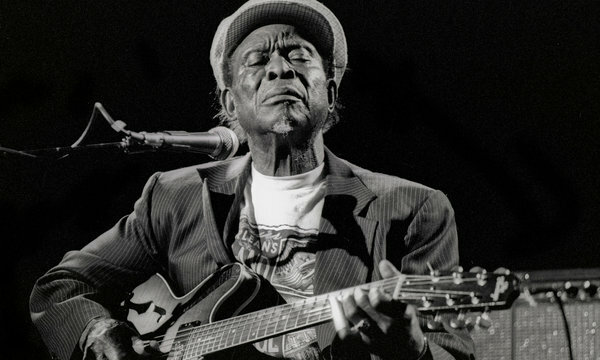 David Honeyboy Edwards, believed to have been the oldest surviving member of the first generation of Delta blues singers, died on Monday at his home in Chicago. He was 96. His death was announced by his manager, Michael Frank. Mr. Edwards’s career spanned nearly the entire recorded history of the blues, from its early years in the Mississippi Delta to its migration to the nightclubs of Chicago and its emergence as an international phenomenon. Over eight decades Mr. Edwards knew or played with virtually every major figure who worked in the idiom, including Charley Patton, Muddy Waters and Howlin’ Wolf. He was probably best known, though, as the last living link to Robert Johnson, widely hailed as the King of the Delta Blues. The two traveled together, performing on street corners and at picnics, dances and fish fries during the 1930s. Mr. Edwards had earlier apprenticed with the country bluesman Big Joe Williams. Unlike Williams and many of his other peers, however, Mr. Edwards did not record commercially until after World War II. 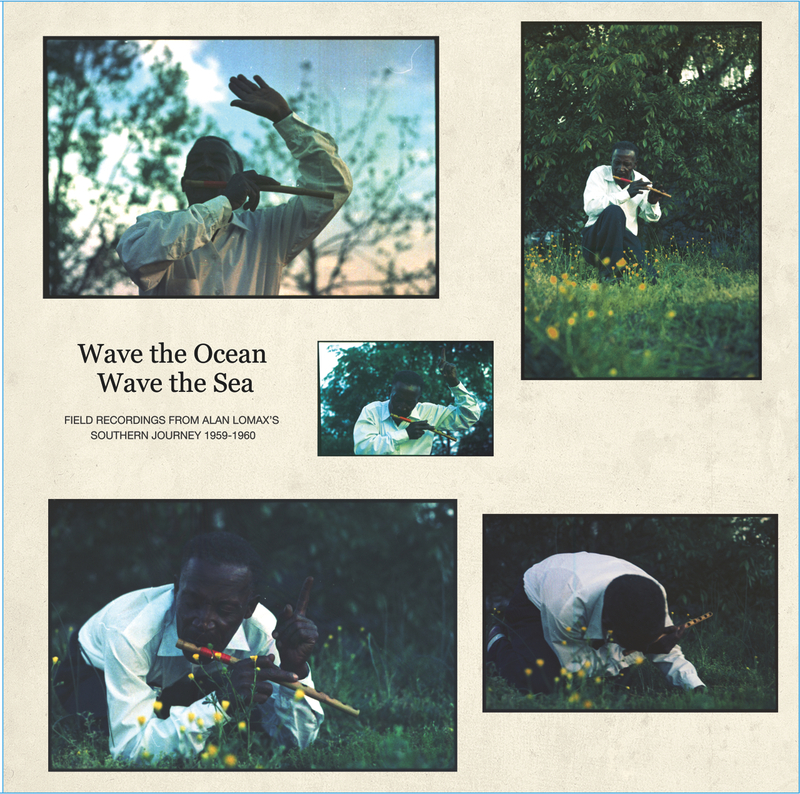 Field recordings he made for the Library of Congress under the supervision of the folklorist Alan Lomax in 1942 are the only documents of Mr. Edwards’s music from his years in the Delta. Citing the interplay between his coarse, keening vocals and his syncopated “talking” guitar on recordings like “Wind Howling Blues,” many historians regard these performances as classic examples of the deep, down-home blues that shaped rhythm and blues and rock ’n’ roll. Mr. Edwards was especially renowned for his intricate fingerpicking and his slashing bottleneck-slide guitar work. Though he played in much the same traditional style throughout his career, he also enjoyed the distinction of being one of the first Delta blues musicians to perform with a saxophonist and drummer. David Edwards was born June 28, 1915, in Shaw, Miss., in the Delta region. His parents, who worked as sharecroppers, gave him the nickname Honey, which later became Honeyboy. His mother played the guitar; his father, a fiddler and guitarist, performed at local social events. Mr. Edwards’s father bought him his first guitar and taught him to play traditional folk ballads. His first real exposure to the blues came in 1929, when the celebrated country bluesman Tommy Johnson came to pick cotton at Wildwood Plantation, the farm near Greenwood where the Edwards family lived at the time. Jake catches us up on what The Cards have been up to, including tours of Europe and Asia, a studio album and a brand new EP. Definitely worth picking up their records, great stuff! Check them out at www.losmusicosviajeros.net . “People were saying that Southern folk song was dead, that the land that had produced American jazz, the blues, the spirituals, the mountain ballads and the work songs had gone sterile.” –Alan Lomax, 1960. Happily, Alan Lomax’s 1959-1960 field recordings from the American South have been reissued on stunning LPs by Mississippi Records out of Portland, OR. 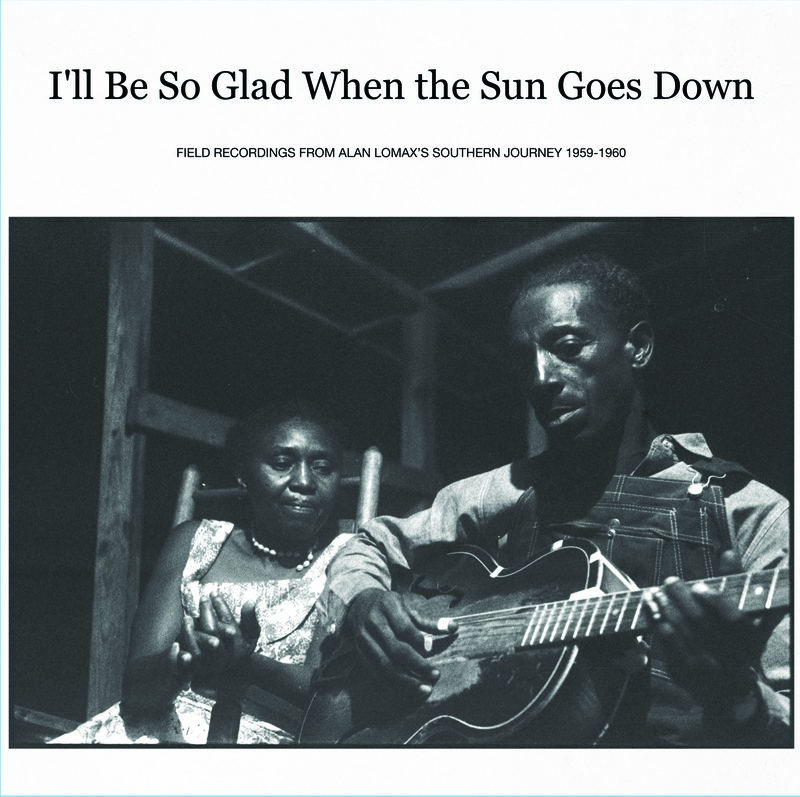 The reissue was currated by Down Home Radio friend Nathan Salsburg over at the Alan Lomax Archive/Association for Cultural Equity. For more information, check out the blog entry at Root Hog Or Die, and be sure to check out Nathan’s awesome online radio show of the same name at EastVillageRadio.com. Malcolm Ford and Jack Byrne of The Dough Rollers were living out in LA over this past winter and in late January/early February Craig and I from The Dust Busters went and stayed with them out there. We had a great time, living down near Venice Beach, beating the New York cold and playing a bunch of shows around the LA area. We even made it up to San Francisco for a gig! One night we ended up playing a house party at Elvis Perkins’ place and happily our set was recorded. Hope you will enjoy… Also, The Dust Busters are out on tour right now on the West Coast, we’re headed to Portland tomorrow and then Seattle. Check out our website for dates. Thanks go to Paul Chesne for recording this show! Down Home Radio favorites and past guests on the program Jerron “Blind Boy” Paxton and Frank Fairfield have recently been featured in the New York Times, following their appearance last Tuesday at the Jalopy Theater. CLICK HERE to read the NY Times piece by Ben Ratliff. CLICK HERE for the Down Home Radio interview with Frank Fairfield, and HERE for the interview with Blind Boy Paxton. Look out for the 2019 Brooklyn Folk Festival! 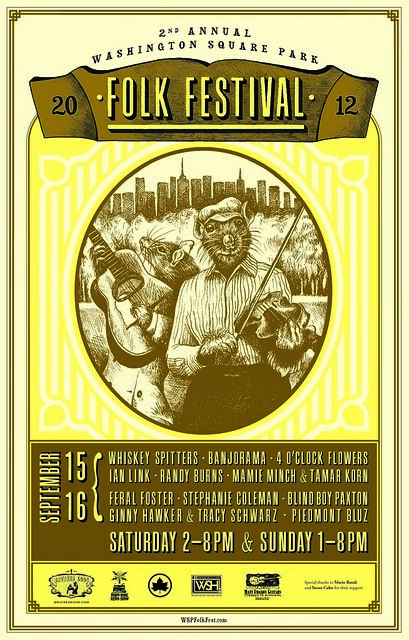 10th Annual Brooklyn Folk Festival!! Folk Music Society of New York, Inc. Copyright © 2019 Down Home Radio Show.